Sherlock Holmes and Moriarty—a different Moriarty—go at each other again, and again, in the pair of tales that frame this cycle of pastiches. Thomas (Sherlock Holmes and the Voice from the Crypt, 2001, etc.) relies on bold invention rather than stylistic imitation in all five of these stories. 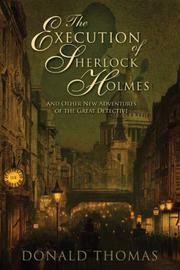 Years after his attempt to burgle Charles Augustus Milverton was interrupted by a lady who shot the blackmailer dead, Holmes is identified by his fingerprints and locked up in Newgate Prison—not by the police, but by a self-appointed vengeance squad headed by the surviving brothers of Milverton and Professor Moriarty. The title story, whose first half is both ingenious and thrilling, describes his escape. “The Case of the Greek Key,” an altogether more mundane affair, sets Holmes the challenge of a complex German Navy cipher in the days before WWI. Holmes and Inspector Lestrade agree to go one-on-one to break a legal deadlock in the case of a married father of six accused of killing a pregnant young woman said to be his mistress in “The Case of the Peasenhall Murder.” “The Case of the Phantom Chambermaid” neatly uses the apparition of a chambermaid entering a hotel guest’s room by night to expose an elaborate case of fraud and murder. “The Queen of the Night” returns Holmes to his duel with Col. Moriarty, this time over the fate of a storied royal ornament. Ceremoniously written, carefully researched and much, much too long.